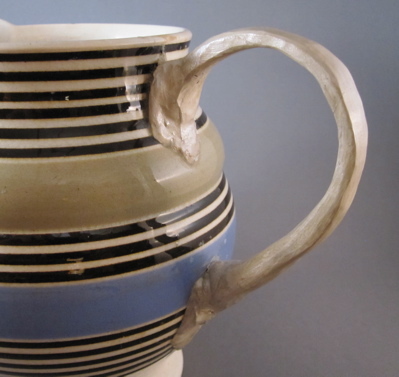 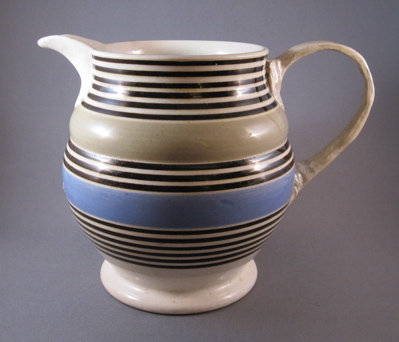 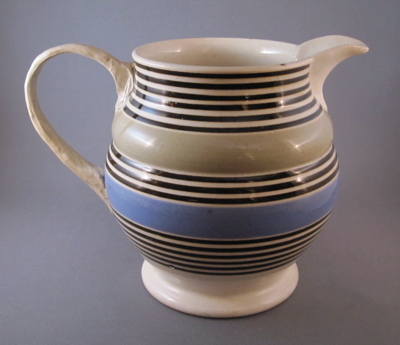 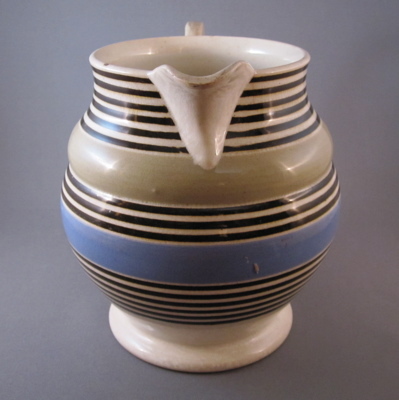 This mochaware slip banded jug with concentric thin black rings and wide drab and blue bands measures 6″ tall and has a flared base. 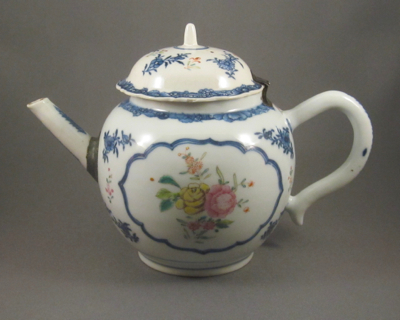 It was made in England in the mid-1800’s and has a poorly made 20th century replacement handle made of clay compound formed over a metal armature. 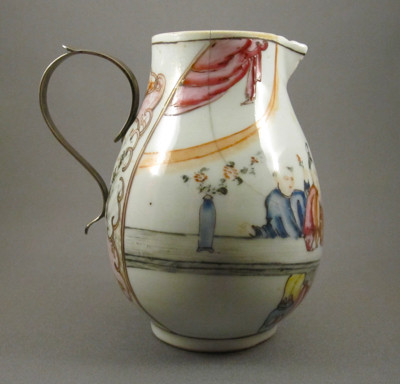 I applaud those who attempt to repair broken ceramics using the same techniques as 19th century tinkers but I would like to strip away the compound and expose the metal handle on this otherwise striking jug. 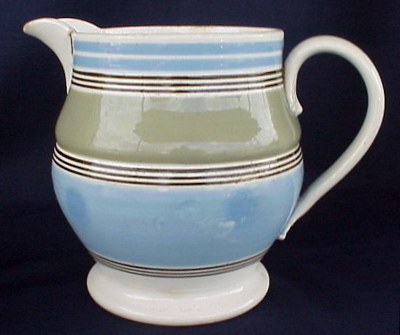 The original loop handle on my jug would have looked like the handle on the jug below with similar form and decoration. 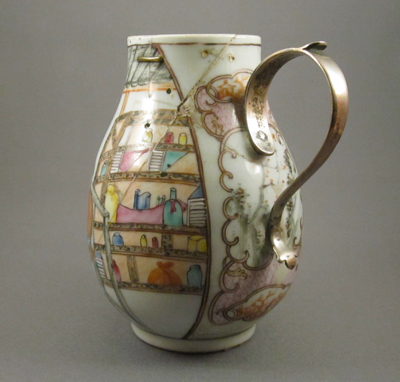 This English child’s mug, boldly decorated with characters created by illustrator and author Florence Kate Upton (February 22, 1873 – October 16, 1922), is made of porcelain and measures 2-3/4″ high. 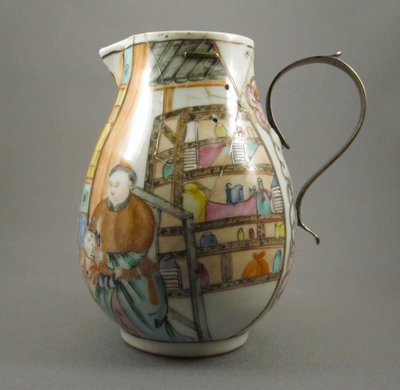 Her ubiquitous Dutch Dolls and Golly characters are represented here with strong graphics and in full color. 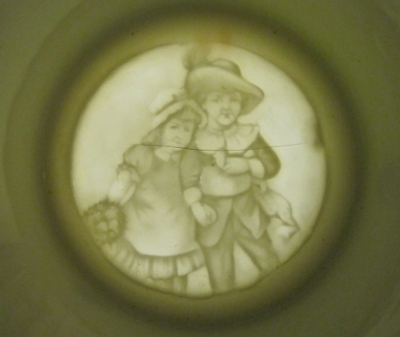 The underside has an embossed lithophane image of a girl and boy, visible only when held up to the light. 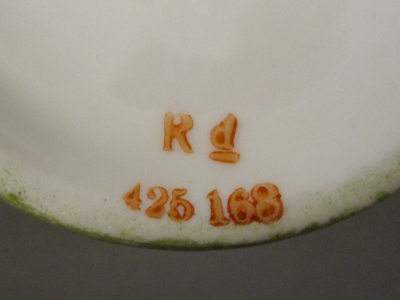 The printed registration mark on the underside dates this mug to 1905. 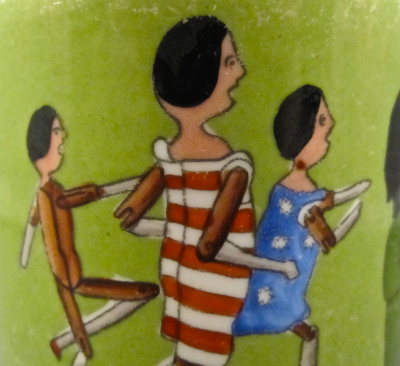 Second only to the Teddy Bear, the Golly was the most popular toy in Europe in the early 1900s. 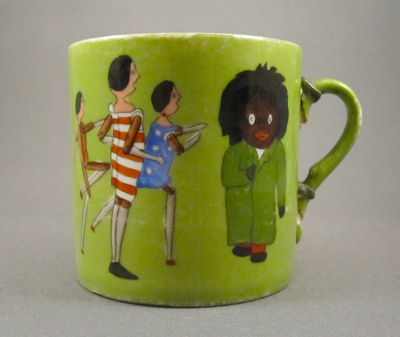 Although Upton wrote Golly as a lovable, benign character, the image and original name Gollywog eventually became a controversial figure, sparking outrage. 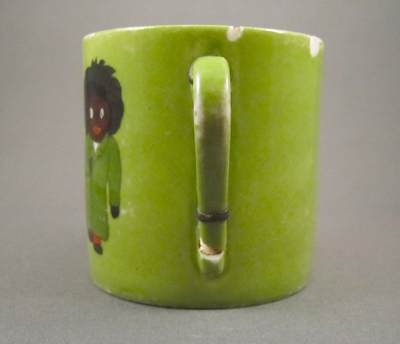 Without a patent, other manufacturers copied the likeness and portrayed the character as lazy and evil, becoming a negative symbol and an embarrassment to the black community. 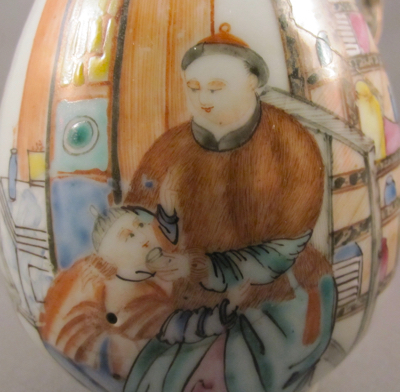 The Guardian wrote an article in 2009, “From bedtime story to ugly insult: how Victorian caricature became a racist slur”, explaining the controversy. 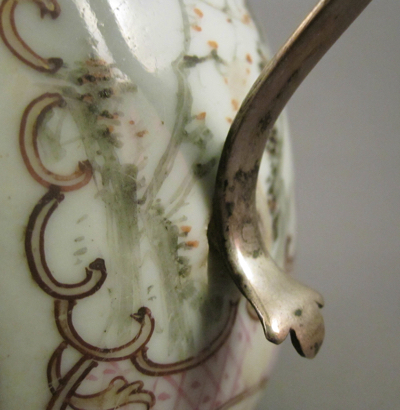 Perhaps, during an all-doll tea party, the fragile mug was dropped by its young owner and the handle snapped off. 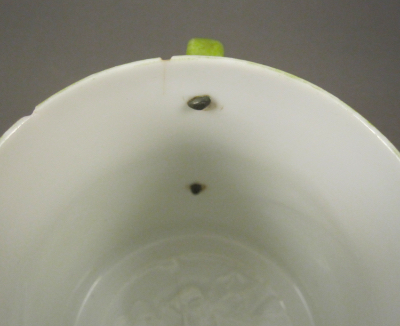 Rather than being tossed out, the broken mug was taken to a china mender who reattached the handle using two metal cuffs and rivets. 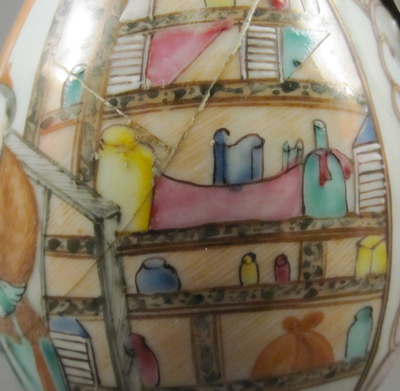 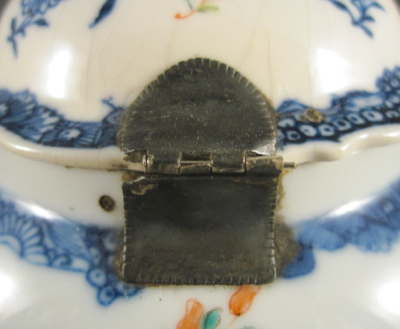 I am surprised that I don’t come across more examples of early repairs on children’s items, as I imagine many tiny hands had trouble grasping the precious ceramic toys they were given to play with, long before the invention of plastic. 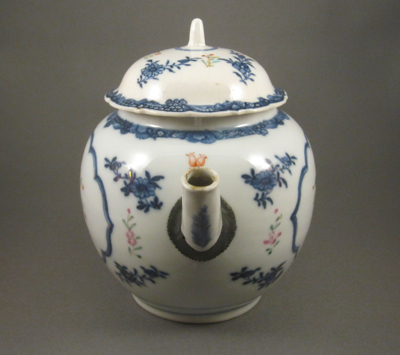 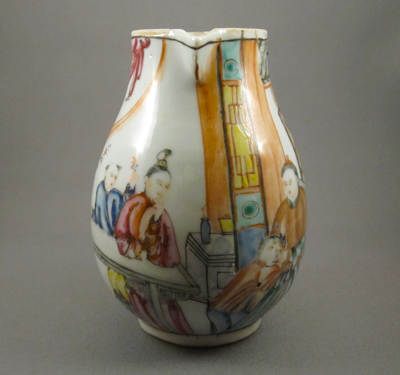 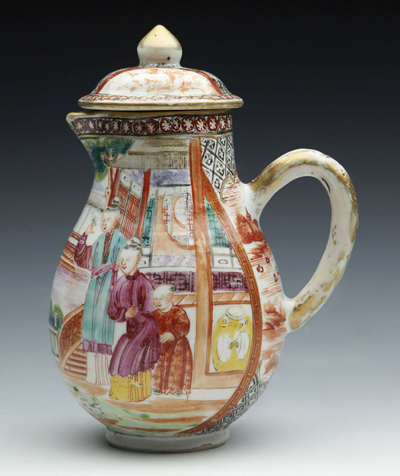 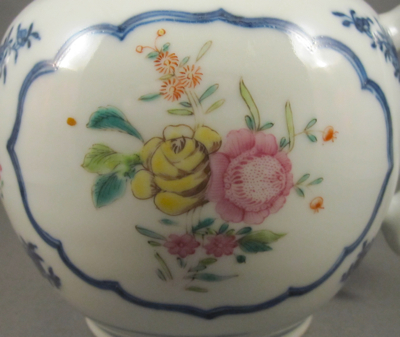 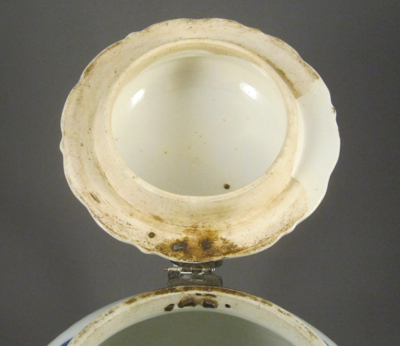 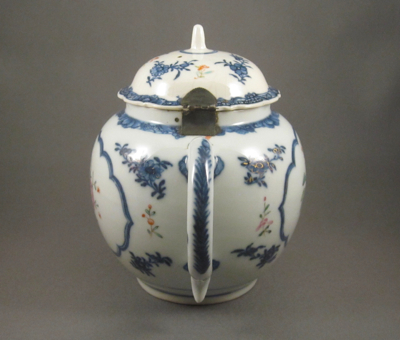 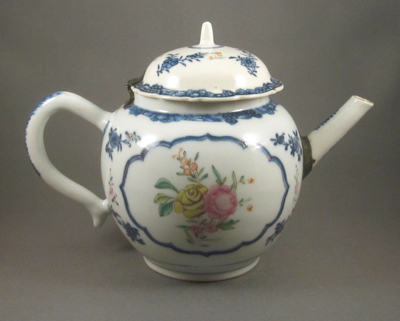 It is not uncommon to find 200 year old examples of Chinese porcelain with inventive repairs, as they were used daily and accidents happened. 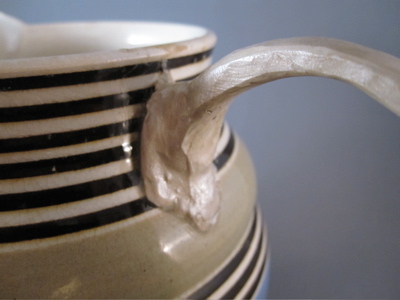 What makes this one extra special is the finely made silver replacement handle. 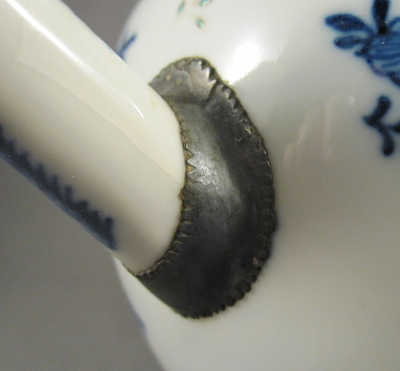 It is more common to find replacement handles made of tin with support straps or bronze wrapped with rattan. 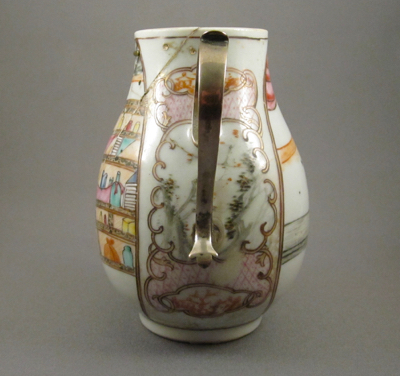 But judging by the fineness of the repair, the owners were most likely wealthy and took their broken vessel to a silversmith who made this delicate replacement handle. 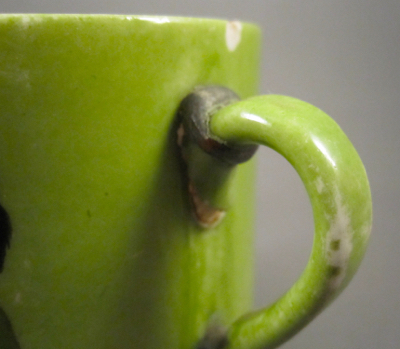 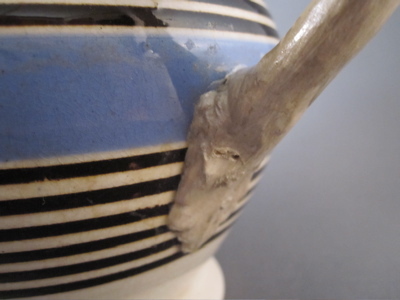 The jug also has a metal staple stabilizing a crack near the rim, further proof of its early, rough life.